For New and Prospective members, please also read our Information and New Members pages. 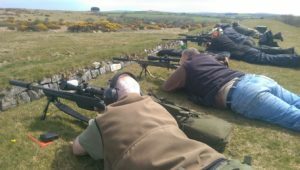 Situated on windswept Bodmin moor, Millpool rifle range is run on behalf of the MOD. 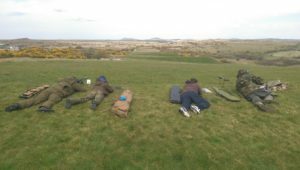 There are firing points from 100yds to 600yds and 10 target lanes, however we only ever start from 200yds due to calibre restrictions. The further back you go the higher you get and from the 600yd firing point the views are impressive. The prevailing South-Westerly winds, certainly seem to prevail and a still day there is a rare thing. The altitude of 850ft above sea level means it is always cooler than down on the coast, but just occasionally the wind drops and the sun comes out. On days like this you can shoot to the sound of skylarks and have to push the butterflies aside to sight the targets. 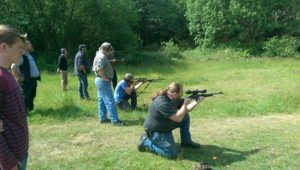 The club normally shoots here once a month all year round; although dates sometimes vary due to bookings by the military. The range is located at map reference SX133699, or for those of you with Sat Nav, the postcode is PL30 4BR. Click here to download the map to the range. 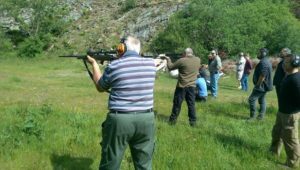 Upon arriving at the Millpool range, make your way down to the target area (the ‘butts’) and make yourself known to the organisers who will pair you up with a club instructor or experienced member for the day. As a general guide, the day will be broken into shooting and butts duty, where you will be marking the targets. The thing that is important is that you must arrive at the correct time no later than 0815 to allow for signing in and any administration etc. before any shooting commences. Situated in a disused quarry, the Parracombe range is a 100 metre range and is privately owned. There is a covered firing point at 100 metres. The enclosing walls isolate you from the outside and there is something of a lost-world feel about the place. The trees, shrubs and heather soften the rough contours, but you are frequently reminded that you are high on Exmoor. 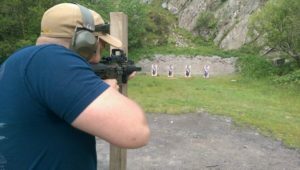 The wind eddying around the quarry can sometimes test your accuracy, especially with the smaller calibres. 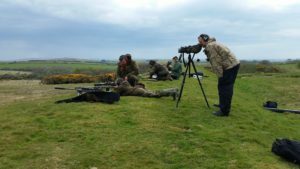 We normally shoot at Parracombe at least one Saturday per month, with other occasional days during the week. Once you have parked in the gravel area of Parracombe, enter the range hut via the door and make yourself known. Note: put on your ear defenders before you enter the range building, as shooting might already be in progress! For those of you with Sat Nav, the postcode is EX31 4QN. Click here to download the map to the range. Following the postcode for Parracombe range will take you within 100 yards of the range. The postcode will take you to a farm on the road to the range. Follow the metal security fence on the right. This fence will lead you to a metal 5 bar range gate, where there is a mobile phone mast on the left of the range driveway. Follow the sound of the gunshots! The day at Parracombe is split into timed details and shot from varying distances. The actual program for the day is driven by the needs of the attendees on that particular day. Arrival time is not so critical, but be aware that the range normally closes around 4pm.